If you’ve been thinking about making some renovations to your home, you should start with your kitchen. Chances are it’s the most used place in your home, so why not change it so that it’s more functional, spacious and appealing to you. Whether you are still in the planning stages or smack dab in the middle of selecting a contractor, here are some kitchen remodel ideas to consider. One of the reasons you may be upgrading your kitchen is because there is not enough storage space. Even though there are some cabinets, they may not be the kind you like. They may also be placed in the wrong areas of your kitchen which can make it harder for you to use them like you should. Keep in mind that you can also make better use of your kitchen’s space by adding hooks so you can hang some of your pots, pans and cooking utensils. Use your imagination and do a little research on cabinets and kitchen remodel ideas for more inspiration. Now is the perfect time for you to upgrade your flooring. Even though it is the kitchen, you are not limited to using tiles. You can also go with linoleum and laminate flooring. If you are interested in wooden flooring, you may want to reconsider. Wood floors are generally avoided in the kitchen area because they can become easily damaged from the moisture that splashes and spills leave behind. The kitchen area also has the greatest fluctuation in temperature which may cause wooden floors to expand and contract more than necessary. If you have to go with wood for your flooring, your best bet is to choose a composite for greater flexibility. It can be very easy for you to overlook the areas in your kitchen that you use the most because you’re focused on its appearance. It is important for you to place more important on these areas so you can improve their function to better suit your personal needs. Since you are the one that’s going to make the most use of your kitchen, it’s best if you use your kitchen remodel ideas to make sure that it accommodates you every way. If you’re remodeling your kitchen because it’s too small to for you to enjoy and move around in, you should consider adding as much counter space as you can stand. While you are adding counter space, don’t forget to think about the materials you can choose from. 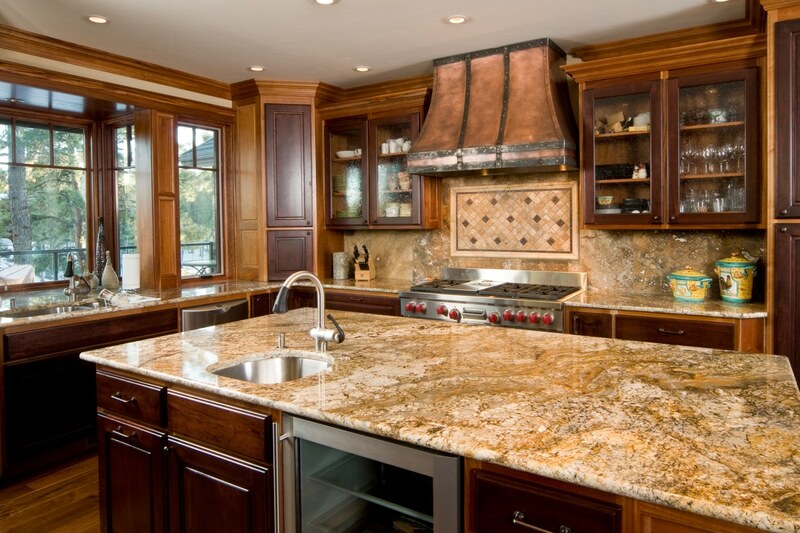 You can benefit from having marble, granite, laminate and other kinds of countertops, but you should keep in mind that each type comes with its own set of pros and cons. Research your options and kitchen remodel ideas carefully to ensure you make the best selection for your situation. Budgeting for any type of remodeling and renovation project can be challenging. Although you may have a firm idea of what you can afford to spend, you should know that most construction projects easily go over budget. To reduce the chances of you have to halt your remodeling project temporarily so you can come with extra funds, you should make function a higher priority than aesthetics. Many improvements that can add tremendous appeal and beauty to your kitchen can cause you to splurge unnecessarily and eat up your budget. Pay careful attention and never lose sight of what you can afford to spend. Need More Kitchen Remodel Ideas? Sometimes your inspiration may run a little dry. That is why you can always count on American Renovation Services. Contact us for all of your renovation and remodeling needs.